This blog post shows a sample coaching guide I created for a client in the Health Care Services industry. 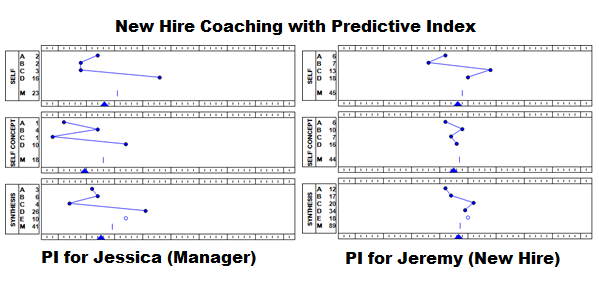 The Client first used the Predictive Index and PRO to help identify the ideal characteristics required for the role. We also compared the PI of the candidate to the PI of the top performers currently in role. Once a hiring decision was made, I created this short coaching guide to aid in the on-boarding process. This coaching guide was presented to Jessica the manager of the new employee (Jeremy). Low B – Both analytical and focused on the task at hand. Comfortable with direct conversation. High D – Both detailed, by the book, formal approach to work. High E – Both logical decision makers – focused on the facts and numbers. Low B – Both Jeremy and Jessica are focused on tasks. Jessica be sure to keep on top of how the first few weeks are going for Jeremy. I recommend scheduling regular coaching or check in times to see how new role is going (the scheduled time is important as he is not likely to ask for help) Ask lots of open ended questions. Plan the meeting ahead of time and give Jeremy a chance to add to the agenda. Daniel – High C – Low B – Takes time to build new relationships and survey the social landscape. Be patent with him in the early going to help him get to know the team. For best results, create an encouraging team oriented environment. Low A – The culture at the company seems to be one of autonomy (mainly High A), make this clear to him from the beginning that he is expected to take charge for his own results and speak up if he needs help, guidance or assistance. High D – Discuss the requirements of the role clearly upfront and provide as much information as is necessary to do the job properly, but no more. Jeremy is an information consumer and will look to get buried in the information if you let him. To keep him moving towards the goals for the job, set clear expectations upfront and give him a road map or plan to achieve them. Jeremy was hired based on several factors. He had a strong resume with applicable past experience in a similar role. Behaviorally he was well suited to the role and strongly resembled the past top performers. Hiring is only the first step. Effective on-boarding and management, especially over the first 90 days is critical to the long term success of this individual. The information gleaned from The Predictive Index Survey and PRO help with New Hire Coaching, to provide a strategy to help the new employee get up to speed as quickly as possible. By focusing on the behavioral needs of the new hire, my experience has shown that clients have less turnover, and a experience a much shorter ramp up period for new employees. For more information on how the Predictive Index can help with your new hire needs, request a free demo.